Tuesday, July 23–Beau Taylor is one of the premier players behind the dish in the Texas League, and he has been a great asset to the RockHounds this season. Taylor is hoping to keep up his batting stats to accompany his already-stellar defensive abilities. 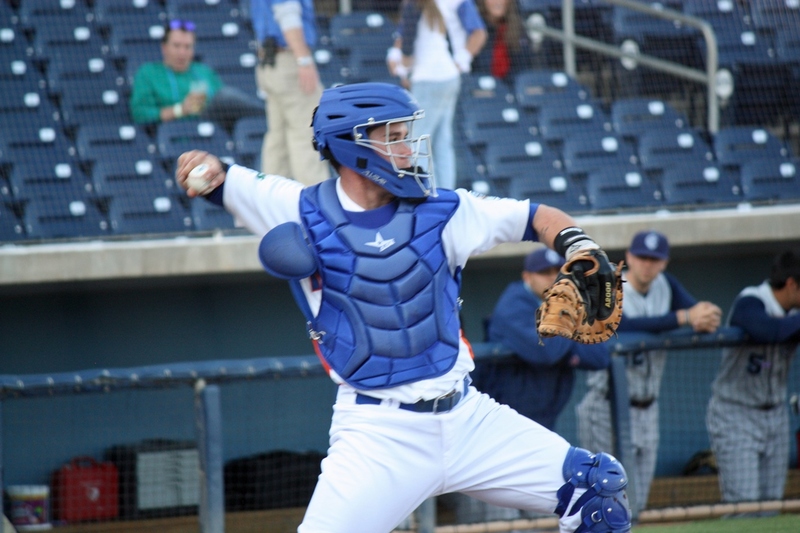 With injuries plaguing the RockHounds this season, Beau has stepped up at DH, as well as catching more than normal. We recently got a chance to sit down with Beau to discuss baseball and his personal life. Playing catcher in professional baseball is no easy task, and keeping the awareness to both control the game and to help the pitcher succeed proves to be a rare commodity. But Beau seems to have figured out both. When tensions rise as the game intensifies, it takes a calm and collected catcher to run out and ease his pitcher. Yet, when is it the right time to call such a visit? Before a big at-bat? Before a pay-off pitch? However, that’s not all he has an eye for. The Rockledge, Florida, native and UCF alum has been utilizing his exceptional fielding since being drafted. Boasting a .986 fielding percentage in his three year career, Taylor also seems to have a knack for throwing out would-be base stealers, catching 25 percent of them this season. Much like the perseverance of his father, Beau seems to always be working hard at mastering his craft. When I asked, besides wins and losses, what the most important statistic was to him, he quickly spoke up about defensive stats. He claims to be “a catcher first,” and it clearly shows. But more than just baseball, Beau Taylor enjoys being a regular guy. If you caught him in the clubhouse before a game, he may be listening to Lil Wayne or Ace Hood on his iPod, playing Xbox, or just relaxing. He says he misses his family and the greenery of Florida. Who could blame him? He also misses the sandy beaches of back home, but his place is on the clay, picking balls from the dirt and throwing out runners who dare attempt to steal against him. Taylor is looking forward to the rest of the season, where he and the RockHounds will get another run at first place. Wednesday, July 10– Sonny Gray has joined his former teammate Grant Green on the Oakland A’s major league roster. Green, called up Monday, and Gray, called up Tuesday, both spent some time in Midland playing for the RockHounds. To make room for Green at second base, Adam Rosales has been designated for assignment. Dan Straily, also a former RockHound, was sent down to Sacramento to prevent him from missing a start during the All-Star break and Gray was called up to fill in from the bullpen. Gray was a starting pitcher in Midland and in a little more than a season was 7-9 with a 3.70 ERA. The former Cubs’ 1st round draft pick out of Vanderbilt has spent this season with Sacramento. Green was drafted by the A’s in the 1st round of the 2009 draft. He has been a top prospect for the organization, and was named the Futures’ Game MVP while with the RockHounds. He spent the 2011 season with Midland and hit .291, with 9 HR’s and 62 RBI. We wish them the best of luck and can’t wait to see them in action. Go Hounds!! June 11—With the first half of the Texas League season gone, the RockHounds seem to be taking a backseat to other dominant teams in the division. But as the midseason reset approaches, there are a handful of players who may be the ones to kick-start this team and push them into the driver’s seat. The 2013 All-Star roster has been announced, and Midland has a lot to look forward to. Sure shot Anthony Aliotti, in contention (if not the front-runner) for Texas League Player of the Year and power hitter Jake Goebbert got the call Tuesday to represent the team. The speedy Dusty Coleman also earned a spot, second on the team in stolen bases and absolutely killing it recently, batting .318 in his last six games, and also finding a niche at third base with several defensive gems. Ace Murphy Smith represents the RockHounds pitchers in the All-Star Game, bringing to the table his five wins and 2.64 ERA. An All-Star Luncheon will be held Friday, June 21 for the great players representing the RockHounds, and one could hope that these gentlemen, along with many others, will be what this team needs to win the division in the second half. For more information about Midland’s All-Star Players, or to watch them live in action, visit MidlandRockHounds.org. And for the RockHounds, this is their situation. With the Frisco RoughRiders heading into town, the RockHounds have a chance to potentially pull within three games of first place; and with the first half of the season drawing to a close, there is no better time for it. 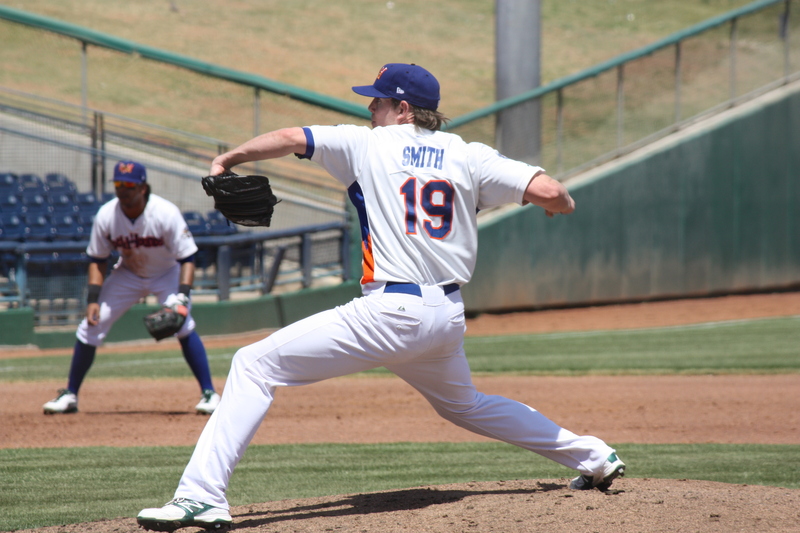 RockHounds’ dominant pitcher Murphy Smith takes the mound against Frisco’s ace, one Carlos Pimentel. Pimentel holds a significant advantage in W/L ratio, 6-2 to Smith’s 5-6; but there is no denying Murphy Smith’s 2.24 ERA, which leads the team for starting pitchers and leads Pimentel by 1.05. Smith is looking to duplicate his last two performances in which he threw for a total of 14 innings while giving up only one run. And as hot as Smith has stayed, Pimentel has been luke-warm at best in his past two starts, giving up five runs in each outing. The only knock on Murphy is when he takes the mound, the RockHounds cannot seem to find the run support he needs for the win. He has experienced three losses in his past ten starts in which he has only given up one run per game. But, with Texas-League’s leading hitter, Anthony Aliotti on your team, things don’t look so bleak. Aliotti has rebounded tremendously from his mini-slump with a double and a homerun against The Corpus Christi Hooks on Thursday, and is looking to bring that power back to RockyTown for the eight game home stand. The mid-season reset falls on Monday, June 17th and could prove to be a fresh start for the RockHounds. With all records being wiped away, and with the heart of the RockHounds lineup batting like this, (.263 in the first half of the season, tops in the Texas League) they seem like a tough opponent to beat. Some of the highlights this series? Saturday is a beach-towel giveaway for the first 1000 fans. Plus who doesn’t love a Family Day Discount on Sunday’s, $2 ticket night on Monday’s sponsored by 7-Eleven, 2 for 1 ticket night sponsored by Baskin Robbins, and do I need to mention Thirsty Thursdays? Catch Murphy Smith, Anthony Aliotti, and the rest of The Midland RockHounds at RockyTown starting this Saturday at 7pm, right here at Citi Bank Ballpark. 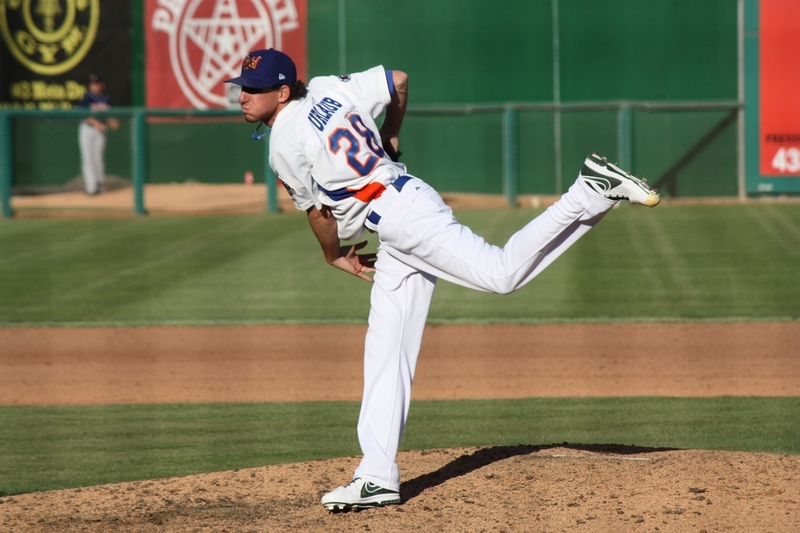 –June 5th, Jeff Urlaub is a relief pitcher coming out of the RockHounds bullpen for the 2013 season. This lefty strikeout specialist has made a name for himself in the A’s organization and is looking to capitalize on his 2.50 ERA nearly halfway through the season. In his last 10 appearances, Urlaub has made opposing batters suffer with a stingy batting average of .179. Urlaub is a Scottsdale, Arizona, native eyeing a spot ultimately with the A’s Major League team. I sat down with him recently to pick his brain on his time with the RockHounds. Q: Who was your childhood baseball idol? A: Growing up, pitching-wise, it had to be Tom Glavine. Our pitching styles are very similar: we both don’t throw really hard, but the way he moved the ball in and out of the zone and the things he could make the ball do was something that I really looked up to and try to do myself. Q: How would you compare the RockHounds clubhouse to others you have been a part of? A: It’s great here. We have a bunch of older guys, and for me being a first year Double-A guy, they help. They definitely help my experience, they have been here before, and they know what to do. They can mentor you a little bit, and I’m always going to listen to what they have to say. Q: What would you say would be your biggest achievement outside of baseball? A: I would say getting my college degree. I was able to graduate in four years and still play baseball at a pretty high level. I have also started working on my Masters. Q: What is your ultimate goal, whether with baseball or down the road? A: I want to be successful with anything I choose to do. My dream as a kid was to play professional baseball, and I don’t plan on stopping until I make it or all 30 teams tell me I can’t do it! But if baseball doesn’t work, out I’m sure I’ll find some way to stay around the game of baseball because I do have a passion for it. Q: Can you briefly describe your process and outlook on coming up through pro baseball? A: The biggest thing is you have to be mentally strong. You have to believe in yourself. Every time you get the ball and go out the mound, your coaching staff believes in you, your manager believes in you, and your defense believes in you. As long as you have those people believing in you, there’s no reason you shouldn’t believe in yourself. Q: As a left-handed pitcher, what are your thoughts on the focus of today’s game using lefty pitchers primarily against left-handed batters? A: At this level, you start to find your role as to what you can do in the Majors. I have taken a more active role on figuring out how to get out left-handed batters. Scott Emerson at Spring Training told me something funny, he said, “If you’re going to make it to the big leagues, you got to get lefties out because they pay right-handers to get righties out.” But my focus is when they give me the ball, whoever is in the [batter’s] box, whether righty or lefty, my job is to get them out. Q: If you were an athlete in any other sport, what would you choose? A: I would love to say golf, but my golf, game is not good! My passion is golf but I would also love to play ice hockey. I can’t skate, [because] I have huge feet. If I could learn to skate, even though I’m skinny, I’d love to fight somebody or hit somebody into the boards. But more realistic, I guess, would be golf, but my dream would be hockey. Q: Who has been the most influential and supportive person or people in your life throughout your career? A: Growing up, my parents were humungous supporters of me. They always said they were proud of me no matter how far I made it and still to this day they do. I also had two close family friends that helped push my game from little league to high school to college. One played for the Yankees and the other is the hitting coach for the Nationals minor leagues. My fiancé Jamie has also been amazing, sacrificing her career to move out here a support me with baseball. They have all been great supporters. Whether he chooses to hit players into the boards or to rack up K’s on the board, Jeff Urlaub seems to have a solid 2013 season going. As the mid-season reset and All-Star break approach, there is no telling what’s in store for the second half of the season for the RockHounds. But one thing we may predict, if its late in the game and a lefty’s up, you know who to call. Steve Scarsone will return to manage the RockHounds in the 2012 Texas League season, with the entire field staff remaining intact from 2011. Pitching coach Don Schulze and hitting coach Tim Garland each returns for his second season with the RockHounds, along with Athletic Trainer Justin Whitehouse, who enters his fifth season with the club. The Oakland Athletics, Major League parent club of the RockHounds, made the announcement today, unveiling field staff assignments for the organization’s six minor league affiliates (Triple-A, Double-A, Advanced-A, Single-A, Short Season-A and Rookie levels). The RockHounds and A’s have also announced a two-year extension to their current player development contract (PDC), continuing the affiliation through the 2014 season. The RockHounds have been Oakland’s class Double-A affiliate since 1999. Missions swept both half-season pennant races and posted the top record in all of Minor League Baseball (94-46) en route to the Texas League title. Scarsone, who spent parts of seven seasons in the Major Leagues during his playing career, is now in his fourth season in the Oakland organization. He managed Kane County in 2009 before leading Stockton to a tremendous second half turnaround and a berth in the California League playoffs (thanks to a league-best 43-27 second half record) in 2010. His first two minor league managerial assignments came with the Arizona Diamondbacks organization in 2001 and 2002. With both the Diamondbacks and A’s, he managed in the (Single-A) Midwest and (Advanced-A) California Leagues. Last season was his first at the Double-A level. In his big league playing career (1992-1999), Steve played for Philadelphia, Baltimore, San Francisco, St. Louis and Kansas City. His finest season came with the San Francisco Giants in 1995, when the infielder hit .266 with 11 home runs and 29 RBI in 80 games. The former first round draft choice of the Chicago Cubs (1980) enters his seventh season as a pitching coach in the A’s organization and his second with the RockHounds. He joined the A’s in 2006, serving as pitching coach for Oakland’s Arizona Rookie League club. He spent the next two seasons with Kane County of the (Single-A) Midwest League before joining Stockton’s staff in 2009. Selected 11th overall by Chicago in the 1980 draft, Don spent parts of five seasons (1983-89) in the big leagues, pitching for the Cubs, Indians, Mets, Yankees and Padres. Ironically, he never pitched at the Double-A level for Chicago, whose AA club during that time was the Midland Cubs. After a 15-season minor league career, Garland is now in his seventh season as a hitting coach with Oakland and his second with the RockHounds. He joined the A’s organization, serving as hitting coach for (Single-A) Kane County, in 2006. He moved up to (Advanced-A) Stockton the following year and spent the next four seasons with the Ports. Tim played for the RockHounds in 1999, the first season of the Oakland affiliation (and the first season of the RockHounds era), hitting .289 with six home runs, 55 RBI and 28 stolen bases. Justin returns for his fifth season with the RockHounds and his 12th as an Athletic Trainer in the Oakland organization. He was named RockHounds Athletic Trainer in 2008 after serving five seasons in the same capacity with the Kane County Cougars (at the time, Oakland’s Single-A affiliate), and was named Midwest League Athletic Trainer of the Year in 2007. Justin is a graduate of the University of Nevada, Reno (where his wife, Susan, is an Athletic Hall of Fame member and recently accepted a position on the university’s swimming and diving team’s coaching staff) and earned his Master’s Degree at San Diego State University. “Across the board,” Oakland made very few changes among its minor league field staffs for the 2012 season. One of the few exceptions involves a pair of former RockHounds managers, who will “swap” positions. Greg Sparks takes over as hitting coach for the (Triple-A) Sacramento RiverCats, and Todd Steverson moves from that position to become the organization’s Minor League Roving Hitting Instructor (a role Sparks has held for the past eight seasons). Throughout the organization, there are plenty of familiar names with direct ties to the RockHounds (see below). Another former RockHounds field staff member has returned to the Oakland organization at the Major League level, as Curt Young has re-joined the A’s. Young, who was with the RockHounds in 2000 and 2001, returns for what will be his eighth season as Oakland’s pitching coach. He served in the same capacity with the Boston Red Sox last season. “Bushy” guided the RockHounds to back-to-back appearances in the Texas League Championship Series in 2009 and 2010, winning the title in the first of those seasons. In 2011, he led the RiverCats to the Pacific Coast League playoffs, posting the league’s best regular season record (88-56). “Emo” was promoted to the Triple-A level, with Darren Bush, in 2011, after four seasons as RockHounds pitching coach. “Webby” enters his second season managing Oakland’s affiliate in the (Advanced-A) California League, after leading the Ports to a playoff berth last season. He was a member of the ‘Hounds as a player, coach, or manager in nine of the team’s first 13 seasons. Webby managed the club in 2004 and 2008, and served as hitting coach for each of the RockHounds’ four playoff clubs between 2005 and 2010. A 14-year Major Leaguer, “Lefty” was both a player (Cubs, 1981) and pitching coach (RockHounds, 2003), while “Mac” enters his 15th season as a hitting coach with the A’s, including one season (2004) with the RockHounds. A former catcher in the A’s system, Nieckula played very briefly (12 games) with the ‘Hounds in 2001. He enters his seventh season as a manager at the Single-A level with the A’s, and has a Midwest League title (2006) on his résumé. 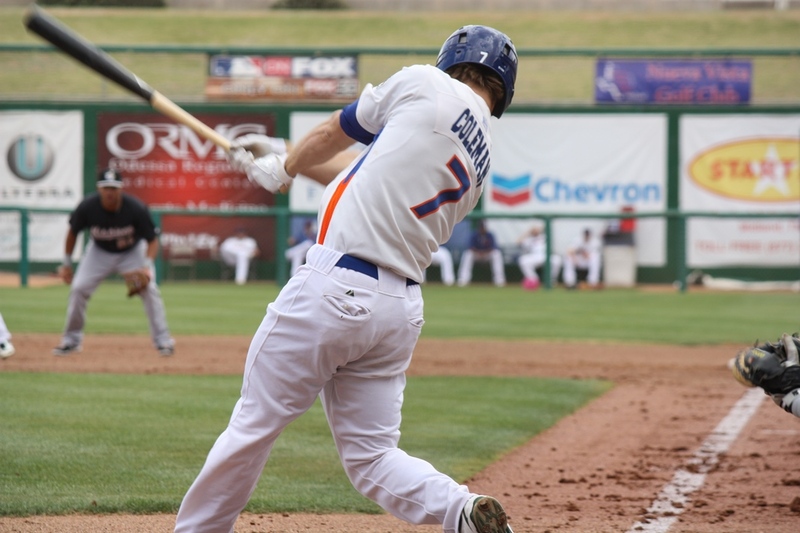 “Casey At The Bat” played parts of four seasons with the RockHounds between 2004 and 2008, and was a key member of the 2005 Texas League championship club (he hit .348 in the playoffs). Casey enters his fourth season as Oakland’s Short-Season A hitting coach. The extension of the working agreement between the RockHounds and Oakland Athletics will make the affiliation the longest in franchise history. The 2012 season marks the 14th year of the affiliation between the RockHounds and the Oakland Athletics, matching the 14 seasons in which the Anaheim/California Angels were the franchise’s parent club (1985-1998). The franchise was affiliated with the Chicago Cubs for the first 13 seasons of its existence (1972-1984). Of the 30 class Double-A teams in the nation, only six have longer-standing affiliations than that of the ‘Hounds and Oakland. It should be mentioned that two Texas League franchises, Northwest Arkansas and Corpus Christi, have affiliation ties dating back to the mid-1990’s, but each franchise has re-located at least once during that time (NW Arkansas from Wichita, Kansas and Corpus Christi from Round Rock, Texas and Jackson, Mississippi.). In 1999, when an affiliation change was in the works, the franchise also elected to adopt its own nickname (rather than utilize the big league club’s name as it had with the Cubs and Angels), and the “RockHounds” era began. On the field, the A’s / RockHounds affiliation has been, by far, the most successful. Of the five trips to the Texas League Championship Series, three have come in the current affiliation (2005, 2009, 2010), including the only two outright league titles in franchise history (2005 and 2009). Note: Each of the 30 Major League clubs has one Triple-A and one Double-A affiliate among its minor league clubs. Double-A teams are divided into three leagues: Eastern (12 teams), Southern (10) and Texas (8) Leagues. Join the RockHounds at Citibank Ballpark for 2011’s first “Pride of Texas Night.” Country singer and songwriter Cory Morrow will perform the national anthem and sign autographs on the concourse during the game. Additionally, the first 1,000 fans will receive a RockHounds blanket. Gates open at 6 p.m.; first pitch at 7 p.m. The RockHounds will be hosting a blood drive to benefit United Blood Services on Saturday from 5-8 p.m. at Citibank Ballpark. Register online (www.midlandrockhounds.org) in advance to set your appointment. All fans who register through the ‘Hounds website will be entered into a drawing to win one of ten $20 gift certificates to the Sidewalk Souvenir Store, as well as a ticket to a future RockHounds game. It’s been a long week; you deserve a fun night out. And, boy, what a night the ‘Hounds have planned for you! Once you have given blood, there is no better way to recover than a RockHounds victory with fireworks after the game. Be one of the first 500 fans and receive a ‘Hounds seat cushion, so you can enjoy your show from the most comfortable seat in Rocky Town. Gates open at 6 p.m., and the game begins at 7 p.m., with the fireworks immediately following. Every Sunday is “Family Fun Day” at Citibank Ballpark. With the coupon in that day’s Midland Reporter-Telegram, fans can purchase five reserved sears for $15, or five box seats for $30. The Golf Course Road Church of Christ is hosting an Easter “Sunrise” service…and the entire community is invited. At 9:30 a.m., the gates will open for the service, and the first 2,000 people to arrive will receive a ticket to that afternoon’s RockHounds’ game AND a free BBQ lunch! The service begins at 10:30 with lunch following. Already have morning plans? Join us for Easter afternoon baseball: gates open at 1:30 p.m.; first pitch at 2 p.m.
Every Monday night, fans can purchase $2 reserved seats or $4 box seats when they mention Basic Energy Services at the box office. Gates open at 6 p.m.; first pitch is at 6:30 p.m. Baseball is meant to be enjoyed with family and friends, and there is no better day for that than Tuesday in Rocky Town. Fans can get two tickets for the price of one with the wrapper from any Kraft Singles product or a coupon from Buffalo Wild Wings in Midland. Gates open at 6 p.m.; first pitch is at 6:30 p.m.
How can ‘Hounds victory make the night even better? When you win, too! If the RockHounds beat the Corpus Christi Hooks tonight, every fan will receive a voucher for a free ticket to, or concession item at, a future Wednesday game. Gates open at 6 p.m.; first pitch is at 6:30 p.m. Baseball is a game of symmetry…and so is this homestand. Just like they started it, the ‘Hounds end the week with Thirsty Thursday in Rocky Town. Fountain soda and draft and domestic bottled beer are half-price. Come early, come thirsty. Gates open at 6 p.m.; first pitch at 7 p.m. Participants will need to wear and bring their own baseball gear and water bottle. Practice apparel or team uniforms are acceptable, as are cleats or tennis shoes. Each child should have a personal glove, and may bring a bat. Each child is required to RSVP and bring a signed clinic waiver form (available online) to the registration table on the day of the clinic. Family members are encouraged to attend the clinics, but we recommend that you bring a cooler with refreshments as concessions may not be available. A post-clinic snack will be provided for all participants. The RockHounds will welcome a new field manager in 2011, as Steve Scarsone will guide the club. Steve, in turn, will welcome the Oakland Athletics’ top prospect, shortstop Grant Green, as part of a roster that includes 15 players from the 2010 South Division championship club. His official career statistics don’t reflect it, but Green appeared with the RockHounds in last season’s Texas League playoffs and, in fact, hit a home run on the first pitch he saw at the Double-A level. The former University of Southern California star spent the entire regular season with Stockton (where Scarsone was his manager) before being promoted to the RockHounds for the Texas League post-season (playoff stats are not included in a player’s official career numbers). Green was also one of three Stockton Ports to be named to the 2010 (Advanced-A) California League Post-Season All-Star team. 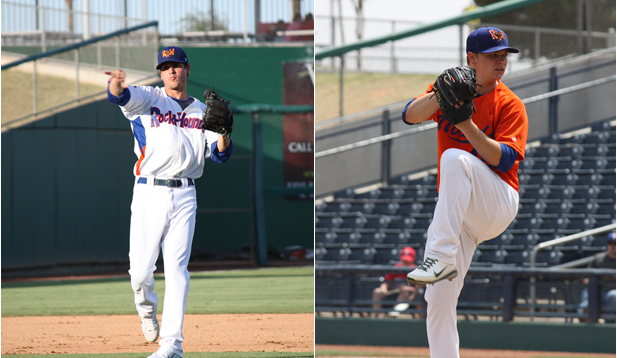 Third baseman Stephen Parker and pitcher Shawn Haviland also earned all-star honors in the Cal League, earning promotions to the (Double-A) RockHounds. Parker, selected by Oakland in the fifth round of the 2009 draft out of Brigham Young University, hit 21 home runs and drove in 98 for Stockton last season and is rated a top-25 prospect on the A’s “farm.” Haviland, a 33rd round selection by Oakland in 2008 out of Harvard University, went 9-6, with a 3.65 earned run average for the Ports. Haviland will be part of a pitching staff that will feature some very familiar names. Anthony Capra, Fautino de los Santos, Graham Godfrey, Carlos Hernandez, Jared Lansford, Lance Sewell, Paul Smyth, Mickey Storey and Neil Wagner all pitched for the RockHounds in all or part of 2010. Godfrey was a 2009 Texas League All-Star for the RockHounds, winning 11 games, and spent most of last season at the Triple-A level. Lansford, too, has pitched for (AAA) Sacramento, and has saved 27 games in a RockHounds uniform. Storey got his first taste of Triple-A in 2010, and has been one of the ‘Hounds top relievers, spending parts of both 2009 and 2010 with the club. Wagner, acquired midway through last season from the Cleveland Indians organization, was sensational down the stretch and through the playoffs as the ‘Hounds closer. Wagner did not allow a run (earned or otherwise) in his last 11 appearances. Capra, who was in the ‘Hounds rotation all of last season, posted a solid 4.27 ERA with 118 strikeouts in 130 innings. Acquired from the Chicago White Sox in the trade involving (former RockHound) Nick Swisher, de los Santos (whose velocity touches the high 90’s) is rated the #13 prospect in the Oakland organization by Baseball America. hit 17 home runs with 92 RBI for Stockton a year ago. The infield is “all new,” with Green and Parker (who play short and third, respectively) joined by second baseman Tyler Ladendorf and first baseman Michael Spina. That quartet formed Stockton’s infield for most of the 2010 season. Although limited to 73 games, Jason Christian, Oakland’s fifth round choice in 2008 out of the University of Michigan, played second, third and shortstop, spending most of the season with Kane County of the (Single-A) Midwest League. Yusuf Carter returns “behind the dish” and is joined by Petey Paramore and Mitch Canham. All three played here a year ago, although Canham did so in a San Antonio Missions uniform. Canham, who helped lead Oregon State University to back-to-back College World Series titles in 2006 and 2007, was signed as a minor league free agent this week. Like Canham, Paramore is a Pac-10 product, and was a star at Arizona State. Petey joined the ‘Hounds a year ago after Carter was sidelined by injury, hitting a solid .263 in the regular season and .304 in the playoffs. Yusuf, in his first full season as a catcher, returned from the disabled list, playing for Steve Scarsone in Stockton in the second half of last season. With the Ports, he hit .278 with 13 home runs in 48 games. The RockHounds open the 2011 Texas League season Thursday, April 7, when they host the Arkansas Travelers at Citibank Ballpark. As much as a winter without baseball bothered him, imagine my pain; when I stare out the window of my office all winter, I’m looking directly at a baseball diamond! Last season, the club set an all-time attendance record as more than 300,000 people attended RockHounds’ games and the Texas League All-Star Game on June 30. Since Citibank had a population more than double that of Midland in 2010, the team has made our stadium a new “city”–Rocky Town. For three hours each night, fans will leave West Texas and visit the capital of fun and family entertainment in the Permian Basin. Throughout the stadium, fans can travel down Line Drive and Rocky Road to their new homes (seats) to watch the game and visit with their neighbors next door. Each area of the ballpark–such as the playgrounds, First Aid station, and contest booth–will also be redecorated and renamed to celebrate the theme. Currently, Rocky RockHound is preparing his campaign for mayor of Rocky Town and is conducting all city affairs from his campaign headquarters inside his doghouse. To assist him, one fan will be named “Mayor of the Week” at every Saturday night game (more details to come). Like any community, Rocky Town is always growing, so we will have many more exciting surprises throughout the summer. As residents, we need you to provide your input about what you would like to see at the ballpark. There’s no need to stare out the window any longer; it’s time for baseball! Welcome to Rocky Town…where fun and family are all in a day’s work! Now that pitchers and catchers have reported, with their position-playing brethren to soon follow, one would imagine that the hot topics of baseball would center on the Giants’ defense of their title and whether the Phillies will be the first team to have four pitchers each record 30 or more victories in a season. In short, after four months of free agency, trades, and arbitration, it’s time to focus our attention on the field. Let’s play some baseball–and if you really want to have fun, we can discuss WAR, VORP, and UZR. Unfortunately, though, the debate of just how gloriously Zack Greinke’s xFIP is going to translate to the Brewers, thanks to his ten starts against the Astros/Pirates/Nationals in 2011, is not The Big Headline of Spring Training. Instead, everyone is now left to speculate whether this will be the last season Albert Pujols is seen in Cardinal red. You see, Pujols is eligible to become a free agent after the season, and, as Baseball’s Greatest Player, believes that the open market will net him a more valuable offer than the $200 million and ownership stake he rejected this week. Over in Surprise, Arizona, the American League champion Texas Rangers are experiencing some discord with the team’s leader, Michael Young. Looking for more playing time, Young has requested a trade. While several teams have expressed an interest, the primary obstacle to a deal is that his contract calls for $16 million in each of the next three years; around the league, though, he is viewed as only a $6-7 million per year player. Imagine being viewed by your boss as “only” a $7 million employee! When you read these stories in the news, and see that the average salary for a Major League ballplayer is now more than $3 million, it is quite easy to look at the Minor League players (such as your RockHounds) through the same, he-has-more-money-than-Senegal lens. For more than 99 percent of MiLB prospects, though, this simply is not the case. While Shane Peterson, Justin Souza, and Lance Sewell may one day sign their own deals comparable to CC Sabathia or Alex Rodriguez, they, for now, are not the among the ranks of their millionaire, MLB cohorts. Last season, Baseball America‘s Garrett Broshius wrote an excellent article highlighting some of the unglamorous, and largely unknown to the public, aspects of being a Minor League ballplayer. Although Broshius was writing about a Giants’ affiliate, the exact story could be told about any Minor League franchise. In fact, several RockHounds last summer borrowed the team chaplain’s car if they needed to make a trip around town. One of the reasons that the players’ union guards free agency so closely is that it is the only time a player is truly able to market his services to the highest bidder. For a player’s minor league career, and his first three years of Major League playing time, teams are able to set a salary, with very few player protections in place. Moreover, the union only represents players who have accrued service time in the Majors; until a player debuts in the Big Show, he has no formal representation (other than his agent). In fact, a first-year player in the minors will make a maximum of $1,100 per month. Moreover, the players are only paid during the six-month baseball season. During the winter, they receive no income from the parent clubs, so many work at least one job–and live at home–to get by until Spring Training begins. Like everyone else, the players have expenses (rent, utility bills, gas), but they also face additional strains on their weekly check. For example, each player is required to pay clubhouse dues; this money goes to the clubhouse manager, who is responsible for providing meals for the players and preparing their equipment and uniforms for the game. In the Texas League last season, dues ranged from $5-7 per day. When a player is added to a club’s 40-man roster, the collective bargaining agreement mandates that he receive a minimum of $67,300 while in the minor leagues. Of course, only 15 players from the minors are on that list (once the 25 active Major Leagues are accounted for), and most of those are “insurance” at Triple-A, ready to be called up in the event of an injury or trade. In 2010, for example, only four players of the 49 men who appeared as RockHounds were on Oakland’s 40-man roster (Fautino de los Santos, Pedro Figueroa, Adrian Cardenas, and Justin Souza). To be sure, there are many great perks to being a professional baseball player. For most people, it is a childhood dream. I would quit my job, today, for an offer of a professional contract. However, when you see several players signing deals worth more than $100 million, or declining nearly double that amount, it is very easy to expect all of them to have that luxury. Remember, then, when the ‘Hounds take the field: these are not the ten-figure stars you see on SportsCenter every night. Soon, they may well be, but, for now, they are playing the game because they love baseball, not because they love money.